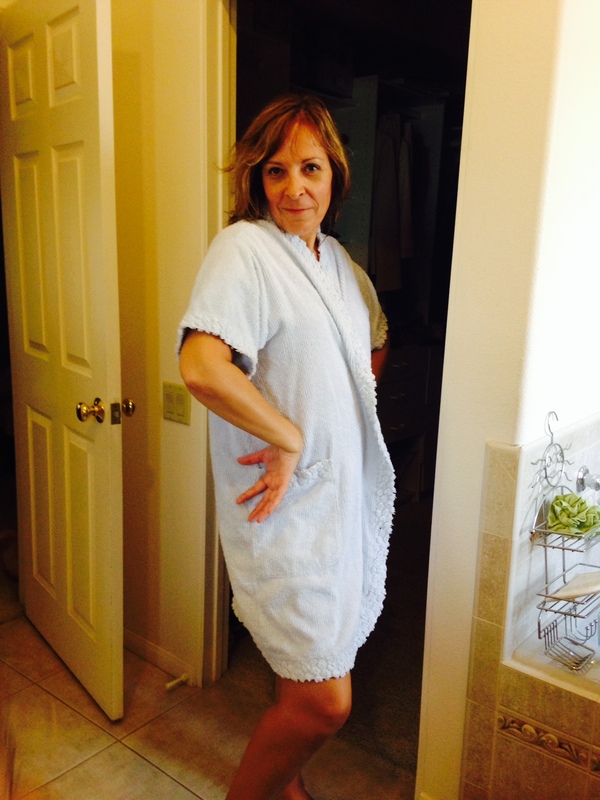 Yesterday, I posed in my 77-year-old mother’s bathrobe. Do I get a brownie button? Like many people, I was appalled when Bethenny Frankel – who is 43 and should know better – snapped a picture of herself proudly posing in her four-year-old daughter’s pajamas. If you keep up on celebrity news, you may have noticed she quickly realized her mistake and posted another photo a few days ago wearing oversized men’s clothing. First of all, the whole selfie thing is getting on my nerves. Second of all, her impulse to brag about fitting into children’s clothes reveals a lot about middle-aged women basing their self-confidence on looks and weight. As I’ve shared before, I’m currently 53. Thank goodness, at this age I’ve let go of striving after perfection when it comes to being a “skinny girl” and am focusing on my health instead. Let’s face it, as we enter our 50s that perfect body is pretty much unattainable without the help of plastic surgery – a road I refuse to go down. And hopefully, we’re at the age when we can finally become more comfortable in our own skin. In fact, a few years ago researchers discovered that Americans’ experience the highest self-esteem at age 60, which is good news for all of us approaching that age. Of course, education, income, health, and employment status all affected self-confidence, especially as people aged. In addition, people in satisfying and supportive relationships tended to have higher self-esteem. Unfortunately, but not too surprisingly, the study showed that women tended to have lower self-esteem than men. 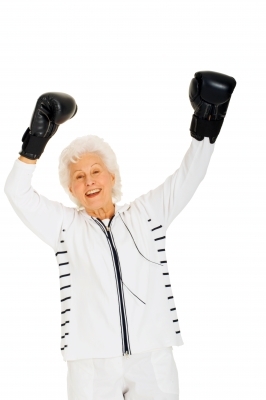 The other bad news is that there is a drop in self-esteem after 60 during old age. This may be due to a change of roles and challenges such as empty nest syndrome, retirement, caring for aging parents, and declining health. The good news is that the lead author of the study, Ulrich Orth, PhD, doesn’t think baby boomers will experience this decline in self-esteem the same way as previous generations. With medical advances, he thinks we’ll be healthier longer and thus work and earn money longer. “It is possible that the decline in self-esteem might occur later in life for baby boomers,” he said. Let’s hope so, since people with low self-esteem often feel reluctant to express and assert themselves and as a result can miss out on experiences and opportunities and feel helpless about changing their lives. Who wants that? We’re getting older and wiser, right? Hopefully as we age, we can give up the inclination to base our self-confidence on what we look like or how much we weigh or what we wear. Instead of beating yourself up because you can’t fit into a certain pair of jeans anymore or perhaps because you’re going through some kind of negative life experience, think positively about yourself and take note of all your strengths, good qualities, and achievements. Remember that you are a special, unique, and valuable person in this world. 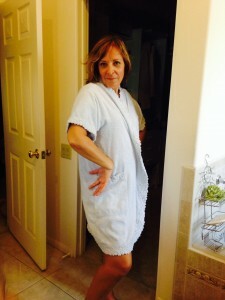 And in the meantime, if you can fit into your mama’s muumuu like me, wear it proudly! This entry was posted in Positive Attitude on July 21, 2014 by juliegorges. What a wonderful, positive message! I’m in my 50s and still struggle with self-esteem at times but I’m not near as insecure as I was in my teens. Thanks for the comment, Debbie. I wholeheartedly agree. I’m also in my 50s and pushing insecurities aside is a lifelong struggle as far as I can tell. But I, too, am getting better at building up my self-confidence and inner strength as I age. There has to be something good about getting older, right?